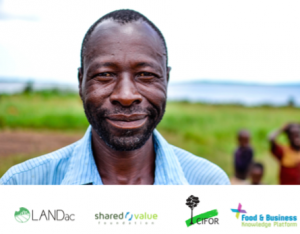 The Netherlands Land Academy (LANDac), together with the Food & Business Knowledge Platform (F&BKP), CIFOR and Shared Value Foundation (SVF) jointly set out in 2017 to design and implement three multi-stakeholder Learning Platforms around investment hubs in Mozambique, Tanzania and Uganda. The final synthesis report has now been published. Land-based investments have shown that deals often lead to conflicts between investors and local populations, which negatively effects local livelihoods and food security. A main issue in these conflicts is the lack of information at and knowledge about the local level. Therefore, the project aimed to bring different stakeholders together, improve the quality and flow of information between these actors, and generate new ideas for creating shared value. Over the course of one year, SVF conducted in-depth, local research, organized multi-stakeholder meetings and conducted follow-up activities for implementation and monitoring. The final synthesis report presents the methodology, the outcomes as well as the experiences and lessons learned throughout the project. In debates around land-based investments, policymakers, governments, development institutions and private sector stakeholders have given attention to making business models more inclusive. One popular approach is through partnerships; to exchange views and become more aware of the different positions/perspectives. As a result, solutions can become more sustainable and inclusive in addressing development challenges. However, in many multi-stakeholder initiatives it is not always clear to what extent “local voices” are part of the discussions and planning processes. There also seems to be a lack of concrete outcomes of the platforms that are being initiated. The Learning Platforms aimed to address this gap: by setting up local multi-stakeholder platforms around concrete investments, strongly involving local voices, and aiming for concrete ideas and solutions; with a focus on local impacts on land governance and food security. Tanzania, Kilombero Valley: weak communication; low trust and transparency; weak leadership, governance and accountability; and limited involvement of local youth in the investments. Mozambique, Beira Corridor: limited employment opportunities; communication problems; lack of opportunities to improve and expand agricultural activities; and limited possibilities to start businesses. Uganda, Jinja-Kampala Corridor: the lack of quality education; land issues; and limited community involvement and participation in the investments. This information was shared during two-day Learning Platforms in each country; attended by the companies, local community members and other development actors present in the area. These meetings were followed up with monitoring activities which consisted of site visits, focus group discussions in communities, and succeeding platform meetings. The elements of local research and multi-stakeholder exchange, coupled with follow-up and monitoring activities formed the backbone of the project. The most concrete outcomes were Action Plans for each of the companies participating in the platforms. The plans were formulated during the two-day Learning Platforms and formed the start of follow-up activities. There are a number of reasons why some activities were more popularly addressed than others. For example; activities were popular when there were clearly-identified benefits for both companies and communities, as well as when issues related to sub-optimal communication and transparency led to negative implications for both companies and communities. Solutions were also popular when they related to technological innovations or linked up with things companies were already doing. The report furthermore focuses on the impacts to date and shows that most concrete implementation is seen in Tanzania. Some factors contributed to this: the longer period of engagement in the area; the fact that fewer companies are present, which creates a stronger feeling of responsibility towards community development; and finally, a strong buy-in to the process and commitment to implementation by higher levels of management as well as community liaison officers. In terms of opportunities and limitations of Learning Platforms for making land-based investments more relevant for local development, the report introduces a number of lessons learned. First, it stresses the value of research for developing a solid foundation for discussions around the main issues and challenges facing investors and local communities. Second, participants of the platforms stressed the importance of neutrality and open stakeholder identification. Neutrality was especially highlighted because land investments are such a hotly-debated topic around which often strong contrasting opinions are seen. A third aspect was related to co-ownership and transparency of the process: stakeholder identification should be an ongoing and transparent process. Finally, it was found to be extremely important to recognize existing power relations between stakeholders. To deal with power differences, awareness was continuously raised on the importance of different types of knowledge – both ‘expert’ and local – while also taking power imbalances into account in the design of the multi-stakeholder platforms. While Learning Platforms are not a silver bullet against all of the challenges, the combination of in-depth, local research and collaborative learning and planning combined with continuous follow-up and monitoring activities enable stakeholders in close proximity to investment hubs to better address challenges together. The process of learning platforms contributes to better alignment of the investments with local needs and ultimately, to an increased likelihood of shared benefits. The final report is accompanied by three country reports, describing in more detail the locations of the platforms, stakeholders who attended, and the discussions and activities that took place. For more information about the project or related activities, please contact the project leader Gemma Betsema, g.betsema@uu.nl.